Looking SE from site of outside toilet. Sunday started miserably with light drizzle – but not enough to stop us digging – and then the sun came out! The corner of a corrugated iron sheet in the bottom of our latest trench was found to be protecting a partly decayed wooden post. As soon as wood is exposed to the elements further decay may quickly set in. 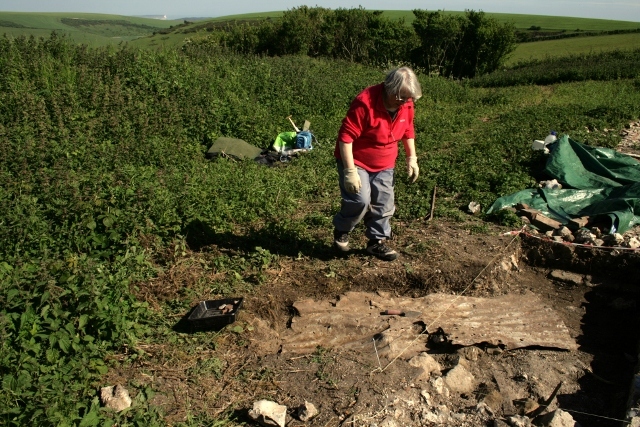 Therefore an extension to the trench was dug to uncover the full extent of what turned out to be a 6 foot corrugated iron sheet which almost entirely covered the wooden post lying horizontally underneath it. The post was a little over a metre long and about 10cm square, dark brown, and with a number of badly decayed nails projecting from its underside. 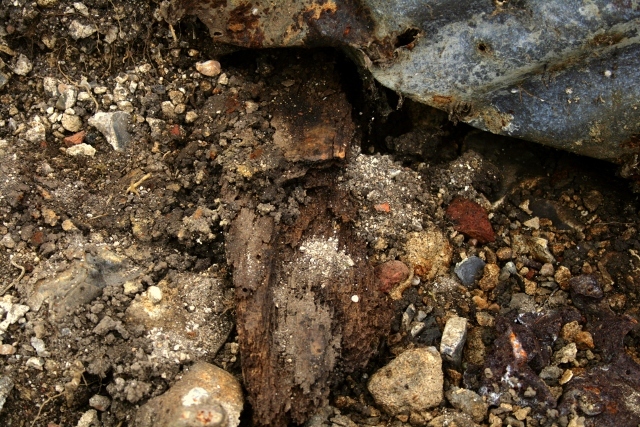 The colour of the wood was found to be of a similar colour to the small fragment of decayed wood which had been found under the site of the stairs. Roof slates, etc under corrugated iron sheet. 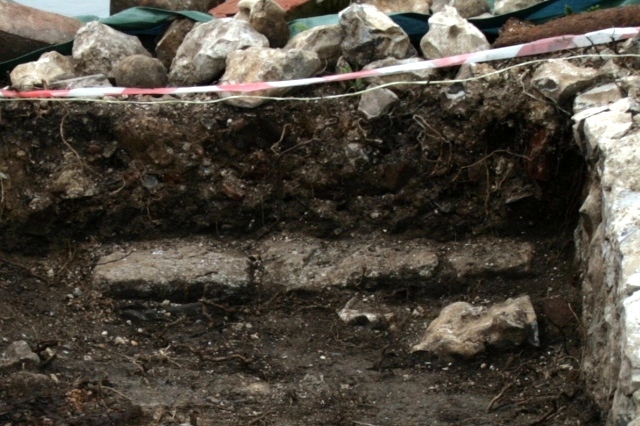 Interestingly, directly underneath the corrugated iron there was little or no sign of the dark loamy ‘garden’ soil which the worms and plant roots had created to fill all the gaps between the, mostly mortar and flint, demolition rubble. 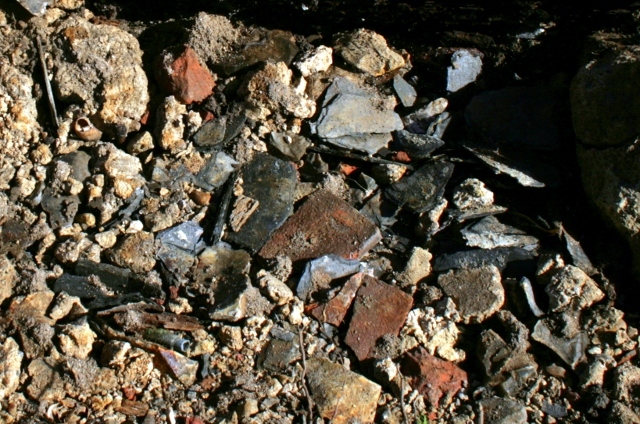 Instead the ground surface was entirely covered with a large quantity of (iron stained) roof slate, and small fragments of mortar and brick, with no soil between them. It resembled the debris from a slate mine. Row of stones possibly marking edge of path to outside toilet. At the north end of the trench a line of slightly rounded medium sized masonry blocks (Purbeck limestone?) were also found, laid at diagonal angles, in the vicinity of where the edge of a path to the outside toilet may have been. Row of stones about 30cm N of front of house. At the south end of the trench similar sized stones have also been found (about 30cm from the front of the house), though these had been laid flat. .303 cartridge from under corrugated iron sheet. Metal container, from under corrugated iron sheet. 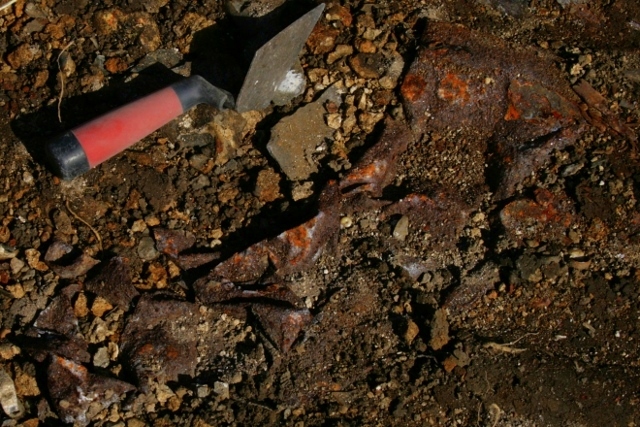 And, a rusty container of unknown origin – possibly it had a circular opening at one end, the other was badly corroded. 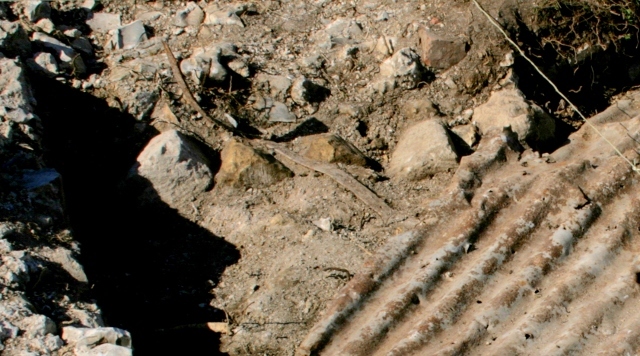 The corrugated iron was at about the same level as the bottom of the ‘rubbish’ fill we found on our last dig day. This is about 30cm below the cast iron water pipe which we found which runs in front of the house, only about 30cm away from the south end of our trench. This begs the question where our original ground level was. It is normal for a waterpipe to be buried to prevent it freezing. Thus there either used to be a very high front doorstep, or the base of the demolition layer we have excavated is below the original occupation ground surface, or the front door was further east than every one of the surviving occupants have recalled. The answer to this conundrum may only be answered by further excavation. 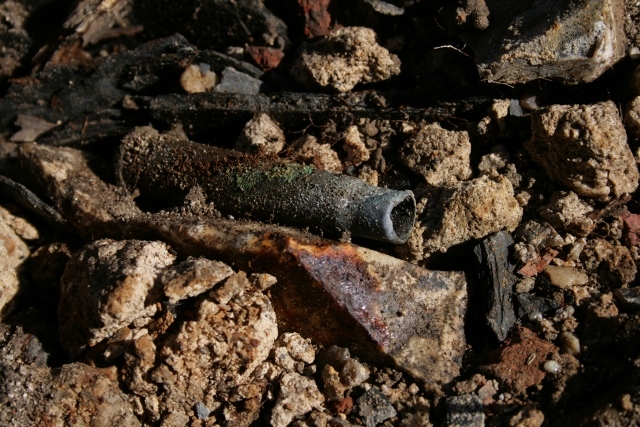 Two parts of a brown bottle base were found bearing the letters ‘UGB’. This means the bottle was made by United Glass Bottle Maufacturing Limited, founded in 1913. One of its more famous parent companies was Ravenhead Glass. They made a very wide range of glass containers.